Rather than consider ‘Urban’ and ‘Soft’ as contradictory concepts, this project rethinks the terms as counterparts to one another. 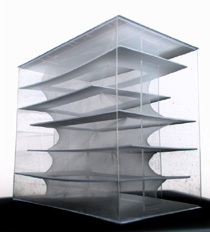 Instead of a series of windows that polarize notions of inside and outside, two transformable layers are utilized: The outer skin becomes a system of operable clear windows while the inner skin utilizes sliding panels with printed ‘windows’ that transition between clear and opaque. The space that is captured between these layers is a kind of ‘soft’ zone – neither outside nor inside, but a gradation between the two. From the interior, the additional perceptual depth allows users to innovate previous conceptions of the domestic. Typological Transformations: 1. The old-law ‘railroad’ tenement had little access to light and air. 2. The new-law ‘dumbell’ tenement enforced small unnocupiable lightwells. 3. 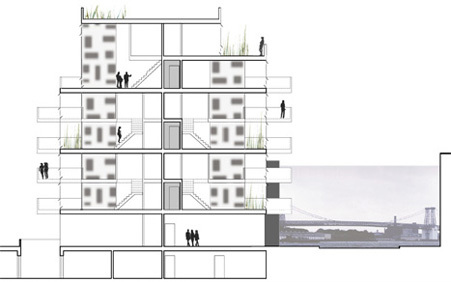 Along with the rear-yard setback, soft lofts proposes a ‘soft’ perimeter of occupiable light and air spaces. Existing Zoning: Low 1 or 2 story warehouses are the defining characteristic that have attracted new residents(left). The new zoning implies complete erasure with 5 or 6 story new construction. Suggested Zoning: By not lowering the proposed FAR, new construction could still be spliced into the existing fabric (left). The sidewall could become a new layer of history among the existing warehouse streetfronts. The sidewall (or party wall) can become a new surface for bringing in light as well as an elevation that participates tangentially with the surrounding urban scene. As only 15% of this wall can be glazed per code, the wall can be more effective as an overall distributed pattern rather than as a few isolated openings. A skip-stop elevator allows duplex units. The double-height soft zone between the interior and exterior is defined by sliding panels that can be configured by the user to naturally vary the environmental performance and transparency of the space.